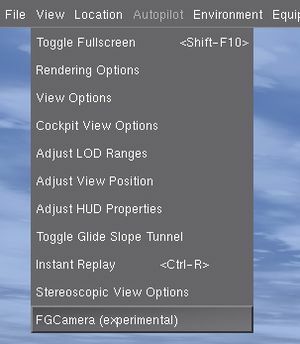 FGCamera is an alternative FlightGear view system, written in Nasal, that adds features similar to EZdok Camera Addon for Flight Simulator X.
Smooth/discrete transition between the views of the same camera type. Caution create backup copies before overwriting. 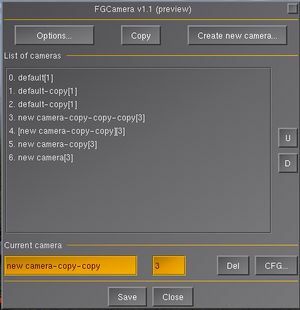 Note FGCamera uses dedicated views with names "FGCamera1", "FGCamera2", "FGCamera3", "FGCamera4", "FGCamera5" with view numbers 120, 121, 122, 123, 124. Some aircraft models check for specific view name, and other check for specific view numbers. 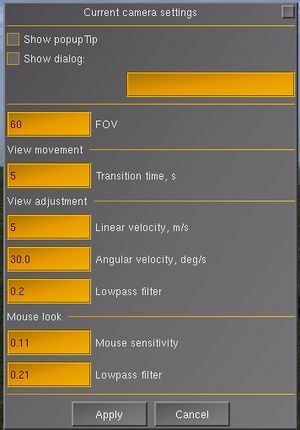 To be fully compatible with fgcamera, aircraft model should check the property "/sim/current-view/internal" instead of view name or view number. Graphical user interface is used to create and manage camera views. FGCamera dialogs can be launched using menubar item View/FGCamera (experimental). "Options" button opens FGCamera's global settings dialog. This dialog is currently non functional. "Create new camera..." button opens new camera creation dialog. The list of cameras shows all the camera views that are created for the currently selected aircraft. Each camera view has its own index. The active view (currently selected view) is marked by square brackets. Category of each camera is displayed as a suffix in square brackets. The active view can be renamed using input box below the list of cameras. The second input box is used to define view category. Buttons "U" and "D" are used to rearrange camera views. "Del" button removes the active camera. "Save" button saves all the cameras data to disk. "Close" closes the dialog (changes will not be saved to disk). "Create" – creates new camera view and selects it as an active camera. "Cancel" – closes the dialog. Transition time – time to move camera from current position to preset position. Angular velocity – angular velocity of camera in degrees per second. Lowpass filter – "smoothness" of the camera movement. "Apply" saves current camera position (does not write to disk). "Cancel" – closes the dialog (current camera position will not be saved). select preset views: 1, 2, 3, 4, 5, 6, 7, 8, 9, 0.
adjust camera position: ↑, ↓, ←, →, Page Up, Page Down. cycle through categories: ⇧ Shift + ↑, ⇧ Shift + ↓. cycle through views in category: ⇧ Shift + ←, ⇧ Shift + →. fgcamera-reset-view - resets currently selected camera's position and orientation. camera-type - currently non-functional, suggested value is "aircraft". Done Random camera movement (effects). Effects can be copied/pasted and imported from external files. New dialogs for RND effects management. This page was last modified on 21 July 2017, at 14:45.